Looking for high quality, affordable gutters and downpipes for your home or business? We have the correct Gutter and Downpipe colour to cater for your needs. Whether you need DOMESTIC or INDUSTRIAL gutters. We have the PERFECT gutter colour for your home or business. Take a look at the GALLERY page for our full range of exciting colours on offer. If you didn’t have gutters, water would continually run alongside your home causing damage. Gutters and downpipes work together to ensure that your roofing is working to the best of its ability. Always ensure your gutters are properly working and free from debris that could cause water to clog up and not flow freely. Keep your gutters clean! 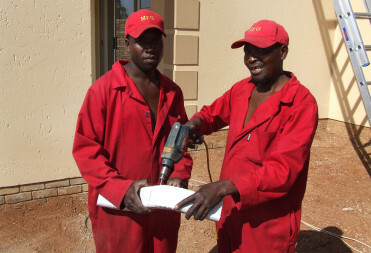 Mr Gutter has been established since 1990, serving all South African homes country wide. We believe in High Quality standards on workmanship, affordability and most of all Happy Customers. With 27 YEARS OF EXPERIENCE, we have proven that we are here to stay and that you can count on Mr Gutter for all of your gutter requirements. Whether it be replacement, new construction, residential or commercial, “Customer Satisfaction is our #1 Priority”! So, when considering your gutter needs… consider Mr Gutter as YOUR MAN! ARE YOU IN DESPERATE NEED OF GUTTERS BEFORE THE SUMMER RAINS ARRIVE? A heavy rain, flowing down house walls to the ground below, can cause a great deal of damage. At the very least, it taxes paint and wriggles into cracks, contributing to eventual, long-term decay. Gutters and drainage systems handle rain-water removal to keep these problems from happening. If you start noticing that your home’s exterior has any mold on it or peeling paint, that may be a sign that your gutters need replacing or fixing. 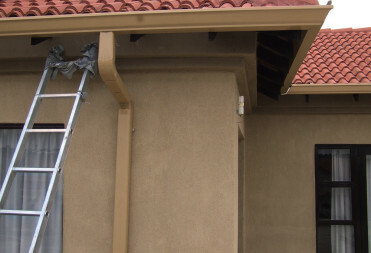 Seamless Gutters are the most popular type of gutter today. The biggest selling point is that they don't have any seams which could potentially leak. The sections join only at inside and outside corners and at downspout outlets. Thank you very much for completing the work at Linden. The new gutters look fantastic and we are very happy with the end-result. Thank you also that despite a rocky start, you’ve persisted with great service. Please also thank Alex and his team. This letter serves as a reference letter for Mr Gutter generally and Driekus specifically. Over the past 4 months Driekus has been installing gutters and downpipes at Rand Aid Tarentaal village. My company is the main contractor on this renovation project. It has been a pleasure to work with Driekus and all his staff! Driekus has been found to be absolutely honest and efficient in the completion of the agreed guttering work. As is always with the nature of construction work, there were a handful of issues that were only very minor in nature. This in generally related only to, for example, my clients request to move a downpipe a bit to the left or to the right etc. Driekus dealt with every one of these minor issues willingly, quickly and with a smile! Well done! We will definitely make use of there services again! Please feel free to contact me if you require further information or would like to see the work at the village. I’d like to take this opportunity to thank Mr. Gutter and both teams for the awesome work done on our home, it is truly beautiful and is greatly appreciated. Thank you and God bless you. Mr Gutter is First Class! The REAL DEAL! The teams service is superb. I would recommend Mr Gutter to anyone who not only wants to have great quality looking gutters around there home but also gutters that are guaranteed to stand the test of time. I don’t want to have to think about them again but they must always look great around my home. That is what’s important to me. Thanks again Mr Gutter for exceptional speedy service. You are TOPS!! Customer Satisfaction is our #1 Priority”! 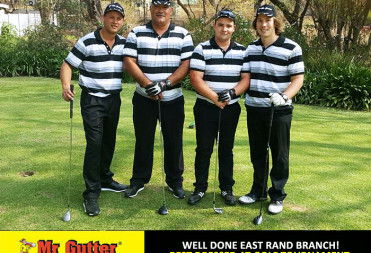 Well done to our East Rand Branch!